This blog is going to be about Angels, and why being the most nominated play in Tony history is important. But it’s also a little bit personal. The Tony’s have book-ended my Theatre Nerd career, and so my research career. When I was 18 I flew to New York the night the Tony’s were happening. It was my first solo trip to the city, and I was going to see Hugh Jackman in The Boy From Ozagain. I’d seen it by accident the December previously, and fallen in love. Not just with the show, but with theatre, and as every theatre kid does at some point, with Broadway. That show changed me in that it’s the first I really connected with, but that show also put me on the path to my PhD. It is, for those who don’t know, the story of Peter Allen, Australian Singer-Songwriter who died of AIDS. (Except they never mention the word AIDS in the show, but that’s another thesis altogether). And to this day I can’t explain it but being a slightly strange kid (evidently) that set me on a rabbit hole of research, and years later I’m Dr-AIDS- in- Theatre. Enough about me. Why did it matter that Angels was the most nominated in Tony history? Oh, many reasons. 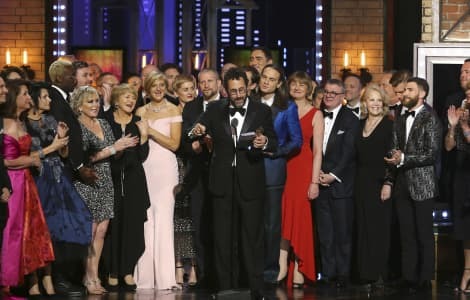 The Tony’s more than London awards are the event of the New York season. Productions still live and die on Tony nominations, and while that’s not the case for Angels having it included- and no less included in the opening, with the Angel flying in- is an indication the production has truly been welcomed back ‘home’. That the British production of the American play garnered quite so many nominations (a record for a play at 11) shouldn’t be underestimated in a theatre culture that mostly likes to recongise it’s own. Let’s start with the actors. Firstly, of course the Tony’s recognised their ‘King of Broadway’ Nathan Lane. And of course, he won. I’ll hold my hands up and say I was skeptical about him in the role. But I will say this- he gets Roy Cohn, he gets the charming devil-with-a-smile, but he also gets underneath his skin. I read a criticism that audiences laugh at Cohn’s lines with Lane in the role. Yes, and well they should- he charms them as the real Cohn does, and that makes his evil more frightening, and when the audience cares about him more complex. Lane may have been the predictable Tony win for Angels, but it was no less deserved. And the women of the play. If I were feeling bitter I’d say it’s less a surprise they were overlooked as winners, as the women of this play often get overlooked. Thankfully Marianne Elliott has directed a production which places the women firmly alongside the men in this piece. To that end the nomination for Denise Gough’s Harper – a parallel and an equal to Prior in the play I would argue- is an important recognition. The work Gough does is surpassingly brilliant, and although there was no win for her, to see that acknowledged is important. Equally so, and wonderfully so was the recognition for Susan Brown. An actress who has said she’s striven for ‘invisible’ in a collection of roles that in Angels are often invisible. Brown delivers heart wrenching as Joe’s mother Hannah (my dear ‘Mother Pitt’) to the dark comedy of Ethel Rosenberg, to the oldest living Bolshevik and back again. British theatre collectively gave a cheer when she was nominated, because we’ve known for years just how brilliant she is. And of course ‘the Prophet’ Andrew Garfield. What is left to say about his performance? (well personally a lot I hope I’ve still got a book to write). Each night- or day- he lives that experience of Prior Walter. He commits to the experience of going through what Prior goes through. And he gives an audience a raw, honest feeling but somehow- in keeping with the play- a magical performance. More than that though, in now almost two years of watching him take on this play, I love how deeply he has committed in every way. Personally I’ve got something of a radar for people who love and get this play and those who just give it lip service. Garfield gets it. His interviews about it go beyond simple actor-promotion and there’s a real sense of both his commitment to it, but also a love of what this play stands for. And a sense of the universality of it. 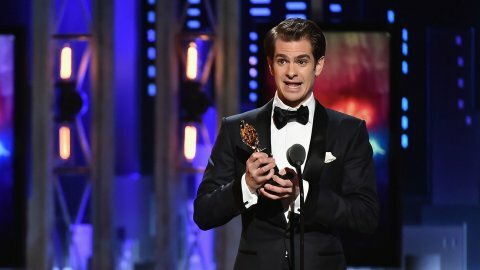 As he accepted his Tony, Garfield reached out to “Countless LGBTQ people who have fought and died for the right to live and love as we are created to”. It’s for this, that I as both as an LGBTQ person, and lover of this play I thank Garfield. His work on stage is astounding, his voice off is much appreciated. And what of the nominations for the play itself? Why is that important? Firstly, recognition as part of the canon. That’s not to say that Angels hasn’t been recognized for some time (a slew of Tony’s the first time, a Pulitzer just for starters). But there is something about acknowledging that, twenty-five years later, back on Broadway this play is significant, and it is still relevant. And the issues are also political, Kushner’s rallying theatrical cry was not meant to be one that endured this long. Indeed, it premiered on the eve of Clinton’s election. Things were (to borrow from British politics of the time) only supposed to get better. Well, we all know how that turned out. Again, in recognizing the play with awards, in focusing attention on it, that voice of politics becomes louder. Once again theatre rising as a voice of dissent. But also, a voice of tolerance. That Kushner used his acceptance speech to call for political action is no surprise- the play is itself a rallying cry. That he combined it with theatre, camp culture and politics is so Kushner, and so this play that it is the perfect punctuation for this revival, for this play. That Garfield in accepting this award, dedicated it to all those who had felt they didn’t belong, reaches to the heart of the play, and what this revival means; it is still necessary because it reaches out to those who don’t belong. And then there’s the reason the Tony’s are important in the history of this play. It hasn’t been back on Broadway in 25 years. Since its original production. Parallel to this, the National Theatre had an intrinsic role in bringing the original version of Angels to life (more on that in an article of mine here). That the National Theatre flew these Angels back to Broadway…that’s something pretty special. That they did it with a woman at the helm…that’s something else. No matter how long I write about this play, I don’t think I can quite do justice to Marianne Elliott’s achievement directing this play. And for my money she made far more magic on stage than the Tony winner this year. It’s sheer magic that it got to the stage; Firstly, convincing anyone to stage it again is itself something. In today’s economic climate, it’s theatrical madness. In London the National doing it, as in the 90s was the only sustainable option. The safety net of subsidized theatre allows plays like this to happen. To then take that risk and bring it back to Broadway…that was bold, it was a risk. The business of it aside, artistically, to bring this production back- back to Broadway- and wipe the slate clean in many respects is so bold. This play, particularly for Broadway holds iconic status, and often Broadway doesn’t warm well to messing with its icons. Elliott went in with a production that doesn’t pay lip-service to the original- it takes the play at face value, treats it with respect but not enshrined reverence, and gave it back to Broadway re-formed. And so the Tony’s are important. To recgonise this revival’s importance with a record number of nominations is truly phenomenal. That it didn’t win them all doesn’t matter. I will say it’s a travesty that the design teams weren’t rewarded, because this production was also built with design in mind from the ground up, and they have created some astounding work. But what mattered in fact was to see this play back up there. It is as urgent as it was 25 years ago. To hear Kushner and Garfield give speeches as politically urgent as when this play was first staged shows how relevant it is. But artistically also, to come full circle, back to Broadway, via the National Theatre. That was truly something. And the award might have gone to another director on the night. But that a British woman director brought this American classic home. And that Broadway welcomed it. Well that’s something. And it may not be a Tony, but I personally want to thank Marianne Elliott for that. And thank you Tony Kushner, without whom none of this beautiful messy, important play would exist.